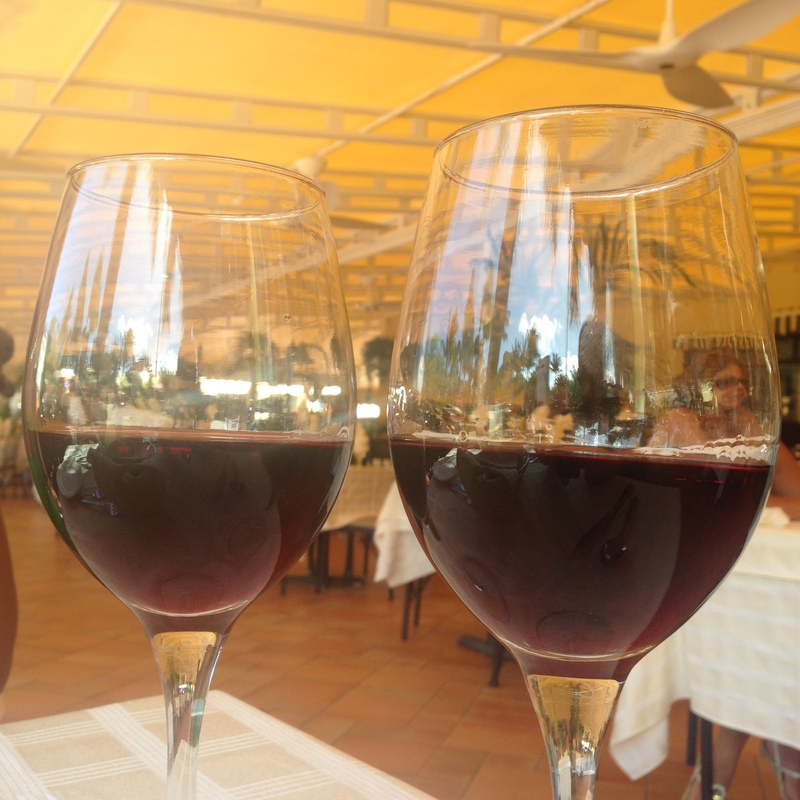 There is no doubt it is a great restaurant, and while dining there you would sooner think you were in Italy than Aruba. On this visit I decided to indulge in their best known dish, Spaghetti al Formaggio Parmiggiano which they describe as “An authentic Italian dish flamed with whisky at your table with fresh tomato sauce and basil”. It is a great display, and the pasta is already cooked in a light marinara sauce of fresh plum tomatoes, garlic and basil. So they come to the table with a carved out parmiggiano wheel of cheese, and scrape up more of it with forks and then pour in flaming whiskey. I asked them what type of whiskey and they said its scotch, I asked the brand and while I could not quite understand with the accent, I am thinking its Lochan D’ora, which is actually a whiskey flavored with honey and herbs. It might seem trivial, but scotch can be quite smokey in taste, and I really was not tasting the scotch. Even though almost all of the alcohol would have burned off, there should still be the taste of the scotch itself. Lohan Ora (which I knew in the 1970s as Lochan d’ora) makes sense, its sweet, not so smoky. You can experiment like I do at home, but below is the result when it was presented at our table. I understand that dining out means that items you can easily make at home can be far more expensive. There is rent, electricity, staff, permits, tax, insurance, etc etc. So trying to keep that all in mind, its still very painful for me, as an Italian cook to digest pasta that costs roughly $50 for 2 people. For $50 I can literally feed 100 people, no problem, no exaggeration. You can do the math yourself, and again, I know that there are overhead costs for a restaurant just to open the door each night, however, this still does not justify the cost and make it mandatory 2 people must eat the same dish. But, the reality is, not everyone has a $300 wheel of parmigianno reggiano in their kitchen. Of course, you can buy a smaller piece, but you might not get the same effect. This restaurant has such high standards. Everything is done in the true, authentic Italian way. The service is almost too good (I don’t like random wait staff constantly asking me how everything is when I have food in my mouth or when I am trying to have a conversation with my girlfriend). The freshness of the food is clearly a quality that is Italian. Even a plate of the antipasti is to be savored. Though I’ve been here 3 times, it was not nearly enough times to sample all the things they have to offer. Dining at Gianni’s one lazy afternoon literally brought me back to Italy in my mind. 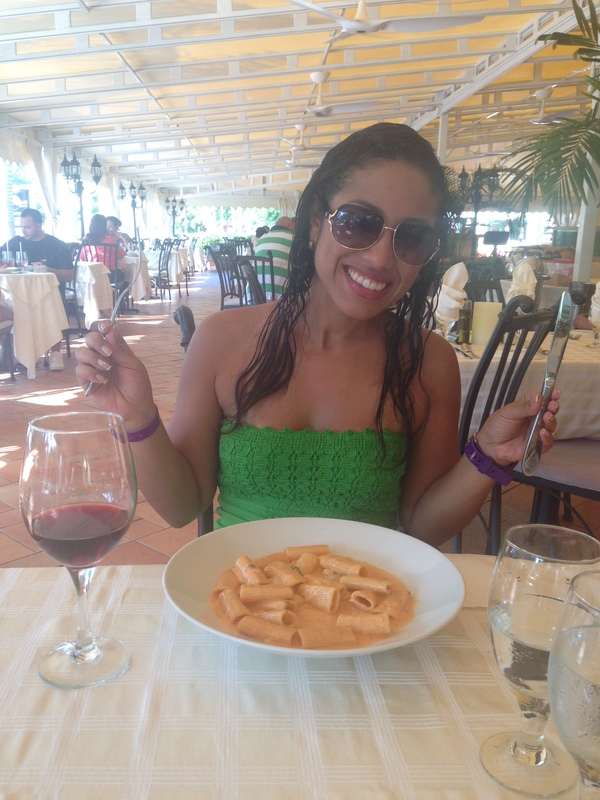 The food was impeccable, from the wine to the antipasto to the pasta. The food was very fresh, prepared well and perfectly and you can tell even the pasta was of very high quality. However, the service was very slow, even though there were more waiters working than occupied tables of patrons. I actually had to go hunting to find my waiter and flagged down other waiters to get the check. I was not in a hurry, however, after spending nearly 2 hours there, me and my girlfriend were missing out on beach time on our last full day in Aruba. To be fair, it was the day after Carnival and somehow it is considered a holiday on the island. Perhaps not an official one, but an unspoken one since nearly everyone is or should be hungover from the celebration. So, all things being equal, I will focus on the food and not the service. After ordering the wine, we ordered the appetizers, better known as the antipasti. I wish I could remember the name of the wines, one was a Merlot from California and the other a Pinot Noir from Italy. The choice was good because I loved the pinot noir but my girlfriend loved the Merlot, so I did not have to share it or give up my glass for hers. The cold antipasto, some very delicious cuts of prosciutto, sopressata, mortadella, marinated mushrooms, fresh mozzarella, sharp provolone, green and black olives. I don’t mind the one piece of mozzarella, we can slice that in half and share. However, when they only bring you one item for 2-3 to share, its just annoying. One green olive? One black olive? Why not raise the price .25cents so you can include 2 green olives and two black olives so both of us can enjoy a whole one? Its not like you can cut a pitted olive in half, so we each took a bite and shared in this case, but if she was not my girlfriend, we would not be sharing food we took a bite out of. Along with the cold antipasto, I had to order a hot antipasto of fried calamari since my girlfriend (a Venezuelan) had never had it, plus, I love it, so I just had to have it. I am glad the served it with both marinara and lemon (I prefer lemon as it would be served in Italy, and 90% of the time I have to ask for fresh lemon after its been served). 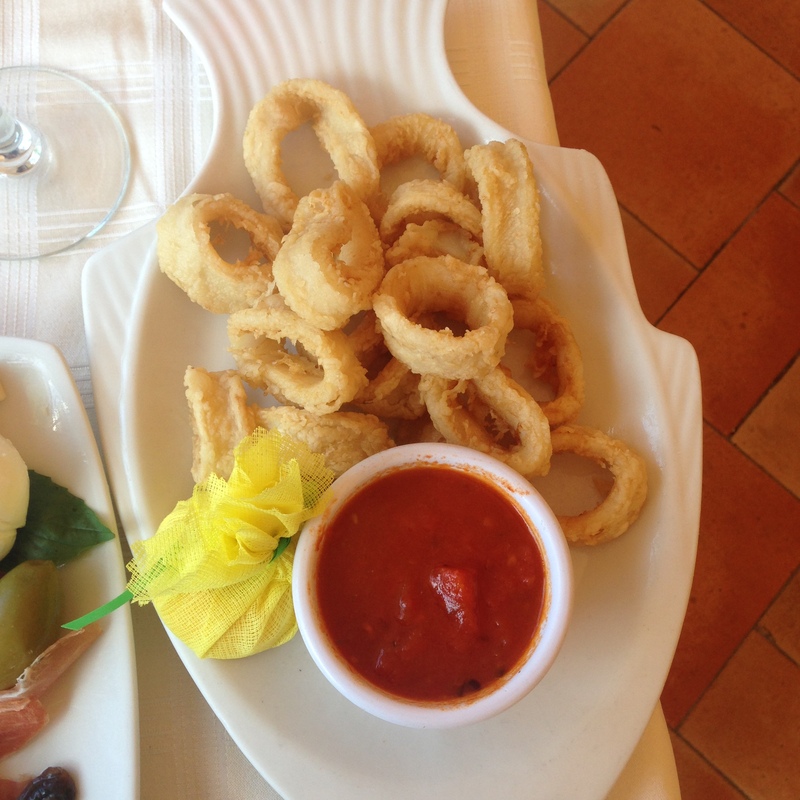 These were the largest rings of calamari I’ve ever seen or eaten and were very good. Not the biggest portion, but I understand all about food waste, cost margin and with the cold antipasto and a full plate of pasta coming, I can understand this. Most restaurants do not operate at a high profit or surplus. It takes years and great popularity before they start turning a handsome profit. So, I am forgiving of portion sizes, especially if its in a tourist area and they know most of the time it will not be taken home, but simply thrown out. While I am tempted to order another appetizer like some fresh oysters, I know I will have trouble finishing the main pasta course. That, and the fact that any girlfriend I have ever had in recent years, never allow me to eat shellfish. If I am lucky, the allow me to eat shrimp, only because they love it too. Its not that I am allergic to shellfish, I am allergic to BAD shellfish, but at that point, its too late, and my face lights and up like a red thermometer and just as hot. 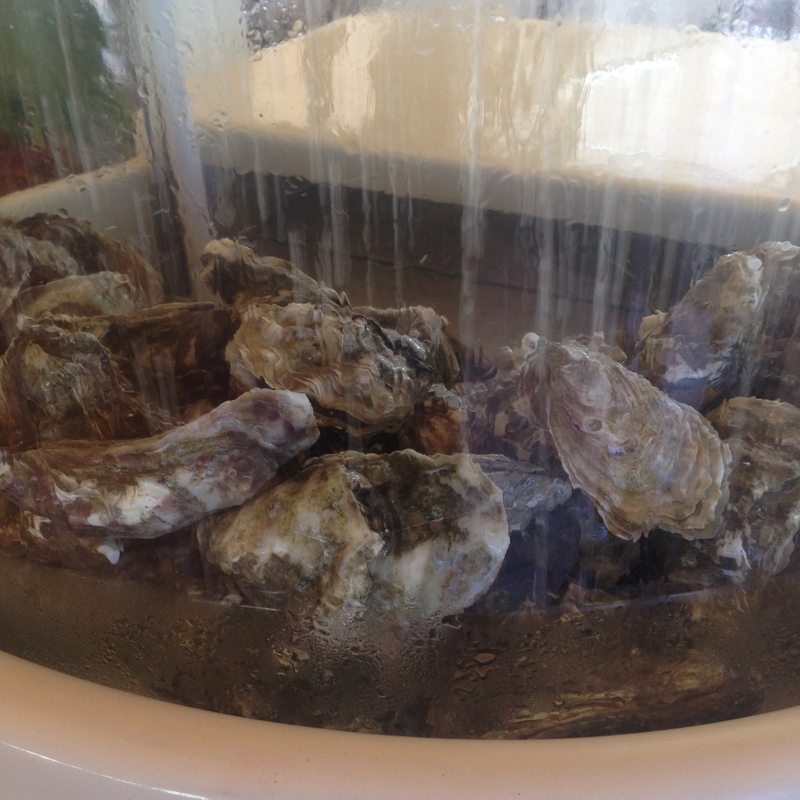 So, as inciting as this is, to see fresh shellfish being properly maintained while waiting to be served, I have to pass it up. So, on to the main course, which is pasta. 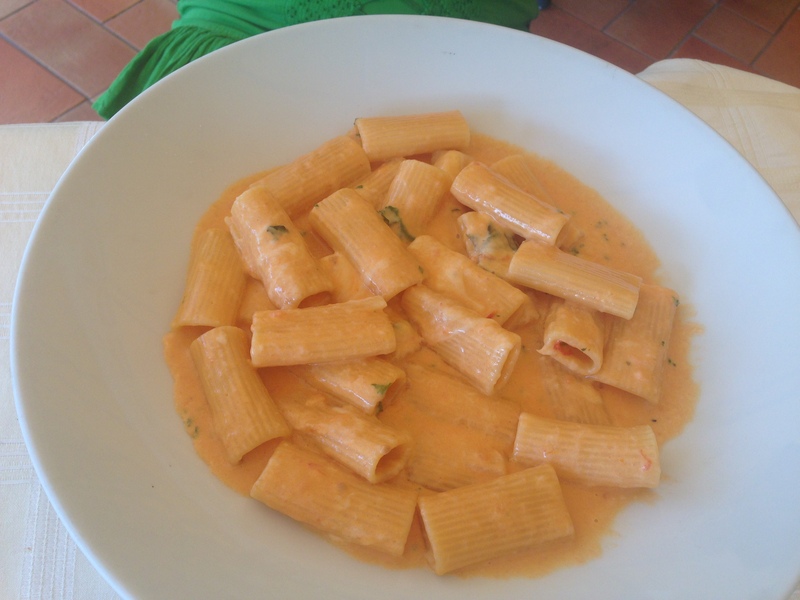 My girlfriend orders the basic Quatro Fromaggio Rigatoni, your 4 Italian cheeses with light tomato and cream sauce. Its delicious, the perfect amounts of cheese, with fresh tomato and some cream, all delicate and perfectly cooked. And of course mine was a tough decision, being Italian, I’ve had pasta nearly every possible way, and my favorites 9 out of 10 times is the way I make it. However, in this case, they are serving it with fresh truffles which I normally do not buy, cannot afford and/or do not have available to me where I live without a long drive or mail order. 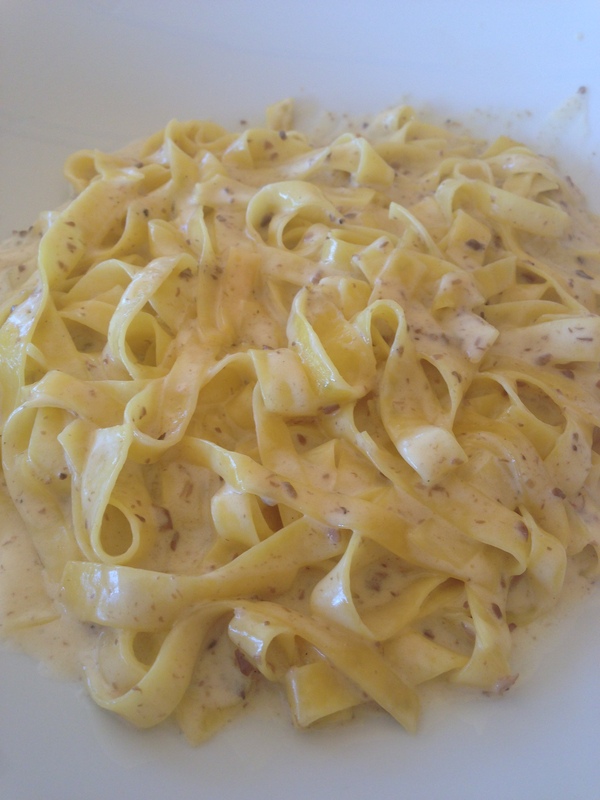 So, the fettuccine alfredo with truffles seems the way to go this afternoon. And, it was very delicious. All those black specs you see is not pepper but black truffle which add a very distinct taste to any food, especially pasta. This pasta looked and tasted like it was made from egg noodle, but still had a nice firm bite. In any case, the truffle and the cream still dominated and it was one of the best pasta dishes I had eaten out that I can recall. There was plenty of it, and I did have a hard time finishing it with all the appetizers, but I was pleased with Gianni’s although I was not thrilled about their service, and even the fact that they wanted me to wait 30 minutes for a table the night before when they were only at half capacity. The bill came to around $120 with tip, not cheap for lunch or even dinner, but they offer no lunch menu, which means, you are paying the same price for items during lunch as you would for dinner. I can beat them up about service and prices more, but the bottom line is, this is an excellent restaurant with excellent food who really know what being Italian and serving Italian food is all about. And the bonus is they are playing real Italian music through the speakers, not instrumental, not 80s nonsense, not even Italian-American classics, but true Italian music. I hope to return here one day.